Hey, guys. This is Masa back from Pyjama Bosses TV, and in this episode, we talk about whether you are proposing to your prospects too soon, and therefore, they’re scared, running away from you as far as they can. Also, we’re going to talk about whether network marketing really equals sales or does it, and also, how you can double your recruiting rates, and how you can double your duplication, so let’s get into it. Hey, guys. 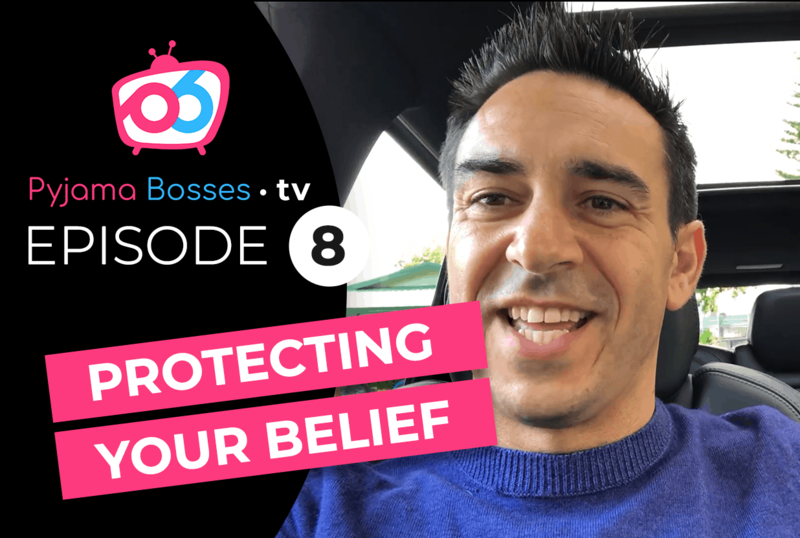 It’s Masa here back with you, and in this Pyjama Bosses TV episode, I’m really excited to talk about what we are really selling in network marketing. Over the weekend, I had a chance to work with some really outstanding leaders. Miguel and I got to be guest speakers to their event, and we were talking about the process of prospecting. In a moment, we’re actually going to go through this process, and we’re going to talk about exactly how you can double your recruiting rates and also double your duplication, so if you’re watching this episode and you’re just recently starting in network marketing, perhaps this is even your first company, your first opportunity, this episode is going to be hugely transformational for you. Also, if you’re an experienced leader, if you’re earning $10,000 or more, this episode potentially is going to really change the way you’re thinking about recruiting and how you can teach your team to double their results, so let’s have a look. First of all, one of the main reasons that I’m going to talk about that actually we don’t successfully recruit, that we don’t successfully get new customers and new team members is actually because we are proposing way too soon. What does that mean, right? Are we getting married here? Not really, but in the process of prospecting and recruiting, we’re always creating that relationship with a prospect. What I know from both my personal experience and coaching literally thousands of network marketers over the last 13 years or so is that one of the main things that trips us up and gets us to not have such amazing results is we get too eager and we actually expose the product, the opportunity, the company too soon. Today, I want to talk a little bit about how you can reverse that, how you can really think about your prospecting process so that you can have more success. Sounds good? First question that I want to answer is, is networking marketing really sales or is it not sales? For a long time, Miguel and I have always been teaching that network marketing is really not sales in the traditional sense of the word, in the sense that by sponsoring one person, by selling package to a customer, this is really not the end result in a sense that what we’re really aiming at is building distribution networks of the products or services that your company is distributing, and so it’s really important to understand that in that sense of the word, network marketing is not sales, okay? That’s why a lot of sales people who are getting into network marketing for the very first time are sometimes not getting the instant results that they’re hoping for. You have to think about it more about relationship marketing and really building the trust, and also about the long term goal of really being the duplication and building that network of distribution. However, today, I want to talk about network marketing really being a very, very match of a sales job in a sense that if you really know what you’re selling at every stop of the prospecting process, you’re going to be extremely successful in creating lots of new customers, lots of new team members. Let’s have a look at what I’m trying to say. You see, in a prospecting process, recruiting process, you have certain steps that you cannot ignore, and you have to understand these are separate steps. The core idea that I want to get through to you today is that if you can focus on going from one step to the other rather than going too fast and skipping through and going right for the sale, right for the package sale, right for sponsoring someone, then you’re going to have a lot more results. In a sense, don’t propose to your prospect too quickly. If you don’t know them very well, don’t ask them to marry you yet, right? What we’re going to first talk about is the different steps in the prospecting process. The first one is when we create a relationship, okay? This is relationship creation. Relationship creation, right? In this step, what we’re trying to do is create trust and respect from our prospect so that later, we can introduce them to a concept of a brand new product that we can refer them to as service or even an opportunity. That is the first step in the process. The second step in the process, once we have created a relationship, and the outcome of this process is actually to have a reason why this person may potentially buy a product or services or join the business. You need to understand their dream or potentially a pain that they have, which could be the potential main reason why they would be buying your products and service and joining the business. Does that make sense? Now, the second step in this process once you have identified the pain or the dream and gain trust and respect is what, is actually inviting somebody. Invitation, right? Invitation. This is where we invite our prospect to have a look at our information. Typically, this is now, of course, an online website where you can have a video tool that you’re pointing to. This is a video tool that they’re going to watch, right? This is the very second step. You’re going to invite them. What I really want to emphasise here is that you’re going to have 100 times, 100 times more results, if not more if you’re going to be using this step in an actual voice conversation whether that’s face to face or on a voice call. Whether that’s a Facebook voice call or just a traditional phone call, that’s okay. If you can do that with a voice call or face to face, this is going to be 100 times more effective. Can we make a deal that from now on, you’re going to be doing this step literally by picking up the phone and talking to people, and you’re not going to do it before you create a solid relationship, trust and respect, identify their dream or pain? Can we make a deal? I really believe you need to understand how important this is. Facebook, on … There’s so many other ones. Zoom and so many other ones. The reason you want to do that is because here, you can actually showcase the process of that you have actually taken the prospect through, so you can showcase the process and therefore, get an inception. Inception. My spelling, right? You can showcase the process that the prospect has gone through up to this point, and therefore, you can create this breakthrough in the prospect’s mind that this, they can do as well, that it’s simple enough, they can actually start repeating it today. The last step, guess what is the very last step here. The last step is getting somebody started, getting started and duplicate. Typically, we say that you can easily create one person duplicating themselves within the first 24 hours in the business, so getting one new customer, getting one new team member in the first 24 hours. These are the four steps of recruiting and prospecting. If you really understand that each step in prospecting and recruiting is separate, then potentially, you’re not going to be actually selling the last step in the first step. The major idea that I want to get across from you is that, yes, network marketing is sales in a sense, and what we do is we are always selling something. When we first get to know the prospect, come in contact with them, we’re going to be selling the trust and respect. The next thing that we’re going to be selling once we identify the dream or pain, we’re going to be selling the phone call, okay? All we’re selling at this point is getting them to commit to a two-minute phone call so that we can invite them to watch a video. Once we have done that, on the same phone call, guess what? We’re going to be selling a follow -up three-way phone call. That’s all you’re doing. You’re just selling the next step. Does that make sense? You’re getting a commitment from your prospect to watch a video and get on a follow-up call. You’re not asking them to actually buy your product. You’re not asking them whether they have a certain pain or something that you can fix with your product. Not yet. Then, on the three-way follow-up, as they sign up in your business, now, you’re selling them the fact that guess what? This is also a business opportunity and that they should immediately start taking action. If you’ll look at prospecting and recruiting in this step-by-step process, when you’re on Facebook just first getting in touch with people, you’re probably not going to be selling the second step, which is, “Hey, do you want to lose weight? Oh, you commented on my Facebook post and you said that you want to lose weight. Should I just send you a link?” This is not what you’re selling. You still have to go through the very first stage of building the trust and respect. Does that make sense? Pay close attention to these steps, and make sure that in each of these steps of the process, you’re only selling the next step of the process. business, the person who is their sponsor should be working with them in picking up the phone three times and actually doing this process. It’s really very essential that you understand the duplication will not happen unless you go through these four steps step-by-step, only selling the next step. Don’t go too fast. Don’t ask your prospects to marry you when you haven’t even gone on a first date. If you’re ever in doubt, do slow down so you can speed up in the long term. Does that make sense? If you’re a leader and what you’re seeing is your team is so excited, your team is so hardworking, they’re out there on Facebook, on Instagram, on LinkedIn, they’re prospecting, they’re trying to recruit, but they’re not having as much results as you would like them to have, then I want you to explain this process to them. I want you to explain to them how important it is to stop at this phase of building trust and respect so that they can identify or uncover their dream or pain point. Only once you have that ammunition can you get forward to the invitation part. Does that make sense? I hope this really help you. Whether you’re a leader, or you’re just starting network marketing, this is going to be extremely important for your success and your duplication to happen. Now, if you’re a leader who’s really serious about their business and want to create a six-figure or seven-figure annual income in network marketing, then please look at the link down below and look at the specific training where we teach you how to 10x your network marketing business through building a system and maximising your duplication. In the meantime, I’m really excited to share more on the next episode of Pyjama Bosses TV.